Alec Griffin, manager of Uptown Angler in New Orleans, has been fly-fishing for the last 15 years and working in the fly-fishing industry for the last 10. As a North Carolina native, Alec found his way to Jackson Hole, WY after graduating from Appalachian State to spend a few months fishing the great Western Rivers he'd only heard stories about. A few month turned into a few years and after spending time working for a couple different fly shops and outfitters, Alec decided to head down South and pursue a career using his advertising degree. 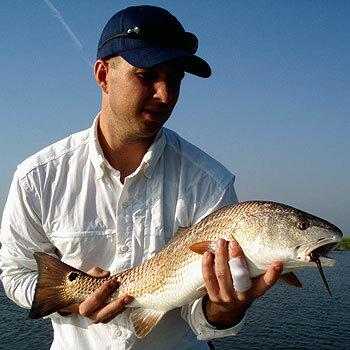 Alec Griffin was hooked on redfish his second day in New Orleans and was amazed at their ferocity when attacking a fly. He's been chasing them ever since. Learn Alec's secrets about hooking up with big redfish on a fly. Luckily, he found a fly shop, Uptown Angler, before he began work at the advertising agency and managed to pick up a part time job there just working at the shop on weekends and other days he managed to get off from his "real job". It did not take long for Alec to realize that the world of advertising was not for him as all he could do was think about spending more time at the fly shop and more time on the water. He soon took over the manager position at Uptown Angler and started on his quest to help share the fly-fishing treasure he'd found with the rest of the world. Having had the opportunity to get out on the flats and chase Louisiana Redfish around the marsh his second day in New Orleans, Alec was hooked on these shallow water predators and was amazed at their ferocity when attacking a fly, sometimes occurring within just feet from the bow of the flats skiff. That was seven years ago and Alec's enthusiasm and passion for chasing Louisiana Redfish on the fly and for helping to grow the sport in New Orleans has anything but wavered. Alec is spending more time than ever on the water these days and has more than a few great stories to tell about the big, the bad, but never ugly Louisiana Redfish. Everyone knows about some of the challenges that Louisiana and it's fishery has faced over the last few years but Alec assures us that the fishing around New Orleans has never been better. He says, "Our Redfish population is extremely healthy. When conditions allow for good site-fishing, it's some of the most visually exciting and explosive fishing you could ever experience. And New Orleans, as a destination city is better than ever. I hear folks say all the time that they need to get down here. Well, we need them to get down here too, and we know they'll be happy they did!" Although he loves fishing for coldwater Trout more than ever when he get's the chance, Alec says he doesn't miss anything. He says that "Louisiana has it all" and that it's hard to miss any other type of fishing when you've got the perfect fly rod fish, and plenty of them, right out your back door. To learn more about Alec's shop services, schools and proucts visit his website, www.UptownAngler.com/.